Since my grandfather first took me hiking on the old DL&W line through Warren County, I have had an affinity for exploring the paths left along these rights of way, always in absolute wonder of how such a bold piece of our area's history could fade into obscure memory. At one time, nearly every town in New Jersey was served by rail, despite the great effort they took to construct. Countless people's lives focused on the railroad, relying on it for industry, food, employment, and transportation. Early steam train lines like the Belvidere-Delaware (Bel-Del), Morris & Essex, Warren, Sussex & Warren gave way to larger companies like the Central Railroad of New Jersey (CNJ); Delaware, Lackawanna and Western (DL&W); Lehigh; New York, Susquehanna and Western (NYS&W); Lehigh and New England (L&NE); Pennsylvania (PRR); Lehigh and Hudson River (L&HR). 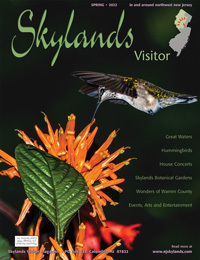 Each had its own character and personality, and shared one thing in common--they regularly worked the hills and valleys of the Northwest New Jersey Skylands. Towns like Phillipsburg, Washington, Blairstown, Oxford, Sparta, Bound Brook, Netcong, Port Morris, and others, were all key locations for the railroads. Cinder path on the Sussex Branch. Nearly all the railroads have, of course, been abandoned; tracks removed, buildings demolished. The remaining "scars" in the earth are level paths of black cinder dirt or ballast stone connecting towns and villages, factories and mines. Walking along these paths I cannot help but imagine how it once looked, and the people whose lives depended on the railroad. Because the trains went just about everywhere, the scenery constantly changes along these paths through towns, woods and farmland, passing the occasional building foundation from atop high fills, to deep cuts through rock. Because railroad grades traverse such varied terrain, a walk along them can be just as rewarding as hiking on conventional trails. You don't need a whole lot of hiking know-how or aerobic virility to enjoy rail trail. You can walk along a rail trail for miles without the struggle of an uphill climb or the danger of twisting an ankle on a protruding rock. The soft cinder dirt that makes up the surface of most rail trails is soft and eliminates the need for a sturdy hiking boot. The trails provide an excellent place for the observation of beaver, deer, mink, muskrat, otter, and other wildlife. And, because the railroad often acted as a super pollinator, spreading seed from unknown, far-away places, many unusual and non-native plant species are evident along the way. Most of the abandoned lines that have been reclaimed as state park trails also welcome bicycle and horseback riders. 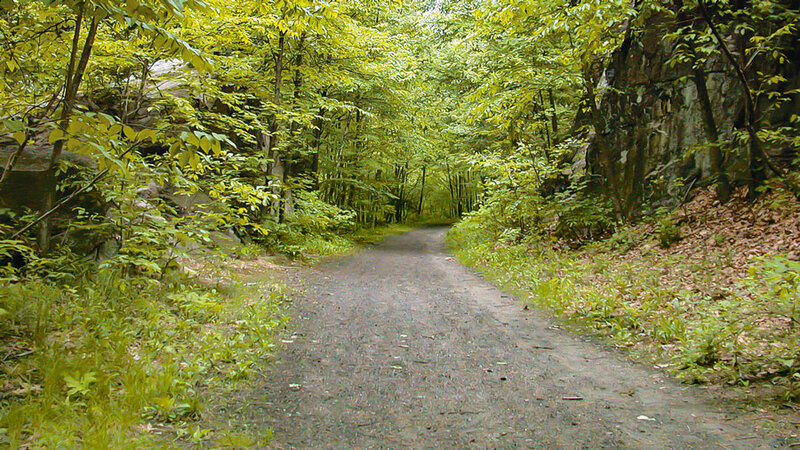 One of the premier rail trails in the Skylands is the Sussex Branch Trail. Formerly the Sussex Branch of the Delaware, Lackawanna, and Western railroad, this line is steeped in history as well as remarkable scenery. With only a few short interruptions, it is possible to trace this abandonment over twenty miles between the towns of Netcong and Branchville. The chronology of this railroad's lifespan is of particular interest. Its predecessor, the Sussex Mine Railroad, spanned only seven miles from Waterloo Village on the Morris Canal to Andover Iron Mine just northeast of the town of Andover. Completed in 1851, this line was narrow gauged, meaning the rails were only forty inches apart. The Mine Railroad relied on mules to pull the ore carts rather than steam engines. This line is referred to as a "predecessor" because the Sussex Railroad, built in 1854 and extended to Newton, utilized only about two miles of the "mine" railroad's right of way. Both lines were the brainchild of Abrahm S. Hewitt, a mining pioneer at Long Pond near Ringwood as well as co-founder of the Cooper-Hewitt furnaces in Phillipsburg. Most significantly, this was Sussex County's first railroad. Walk from the trail's main southern access point on Waterloo Road in Byram Township, across from International Drive at the Trade Center through a beautiful wooded area, skirting Jefferson Lake to the east. Some deviations the mine railroad had from the newer line are now part of Allamuchy Mountain State Park and can make interesting return routes for out-and-back hikes. In fact the Highlands Trail, marked with teal diamonds and linking New York State southwest across Sussex and Morris Counties to the Delaware River in Warren and Hunterdon Counties utilizes both the mine railroad bed and the main line. 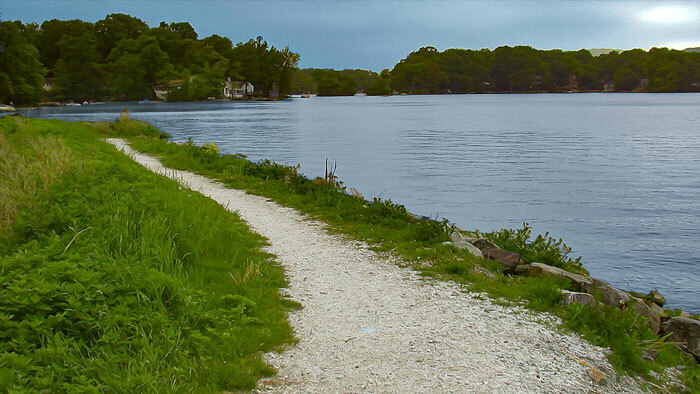 The Sussex Branch’s hard cinder path cuts through rock and woods on the southern end, skirts the shores of Cranbury Lake and widens into open fields north of Newton. The trail continues to the beautiful former resort community, Cranberry Lake, as well as Kittatinny Valley State Park where a variety of circuit hikes are possible. It passes through the towns of Andover and Newton, traverses the swamps of the awe-inspiring Newton Meadows, meets the Paulinskill Valley Trail at Warbasse and heads for the quaint village of Lafayette. At its north end, the railbed traverses a great deal of farmland and offers beautiful scenery of the Paulinskill River and it's tributaries. Later, in 1869 the Sussex Railroad was extended to Branchville, the trail's northern terminus where you'll find an antique store, a weekend flea market, as well as plenty of eateries. While plans were made to extend the railroad through Culver's Gap, they never came to fruition. But you don't have to stop here. It is less than two miles on the road from the Sussex Branch to Acropolis Trail, part of Stokes State Forest, and on to the Appalachian Trail. Abandoned in 1969, the entire rail line was acquired by the state in 1982. Now, with only short sections in Cranberry Lake and Newton where road detours are necessary, foot, bicycle, and equestrian uses are all permitted. Few trails of this kind blend with their surroundings with such intimacy as the Sussex Branch. It is not overdone, no pavement, little or no effort has gone into re-grading the surface. What we have here is a simple path of dark cinder dirt, some ballast rock here and there, surrounded by nature reclaiming the land that was taken from it long ago. For more interesting rail-trail jaunts, the town of Chester, in Morris County is a sure bet. The Patriot's Path, Morris County's continually growing series of trails, makes good use of rail mileage in and around the Chester area. The Delaware, Lackawanna, and Western's Chester Railroad opened in 1869 to access the Chester Furnace and growing mining industry. 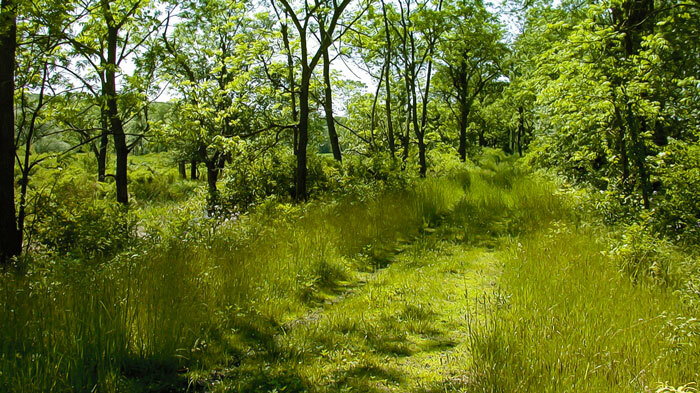 Now, the Chester Branch is a beautiful trail through Morris County's Black River Park and the state's Black River Wildlife Management area. The eastern end of this trail is in Ironia; however, more adequate parking for this part is on the eastern side of Hill Road in Chester Twp. West of Hill Road, there are plans to eliminate a brief interruption in the trail to nearby Rt. 206. West of Rt. 206, however, the trail becomes narrower with blue blazes and is open to foot traffic only. Part of this section is co-aligned with Furnace Road because the railbed lies on private land. There is limited parking along Furnace Road where trails diverge near Tanners Brook Road. From here, the white blazed Patriot's Path leads to ruins of the Chester Furnace, as well as a scenic crossing over the Black River, and the Junctions with abandoned Central Railroad of New Jersey's Chester Hill Branch and Hacklebarney Mine Railroad. The Chester Hill Branch, opened in 1873 (although extensions were made into town and to other mines later) offers another scenic walk through history. From Chubb Park, on Rt 24/513, the railbed makes a surprisingly steep descent (for a railroad, anyway) toward the Black River and Chester Furnace. A missing bridge over Furnace Road, of which one abutment remains, requires a brief detour. From Furnace Road, Patriot's Path makes use of much of this line to its temporary end at Tanner's Brook Road. As of now, the only other completed section of this trail is between Coleman Road and Bartley Road in Washington Township. This section, while very short, offers nice seasonal views over Long Valley. 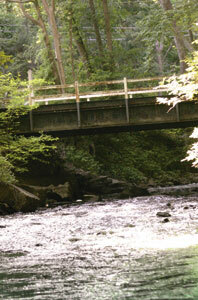 An old CNJ railroad bridge crosses the Black River near Hacklebarney Mine in the Chester woods. Finally, the Hacklebarney Mine Railroad, built in the 1870s to connect the mining area with nearby Chester Furnace, is one of the most unrecognizable yet beautiful sections of rail trail in the state. The best place to park is at Cooper Mill on Rt 24/513 just west of downtown Chester. While the sections of this line from here to its former CNJ junction lies on private property, the section from behind the Cooper Mill to Hacklebarney Mine is open to public. It is possible to continue to the CNJ Chester Hill Branch via the blue blazed Black River Trail. Along the way, it is possible to see the abutments from where the tracks once crossed the Black River, a scenic dammed pond, the now fenced-in Hacklebarney Mine, as well as a varied collection of plant life. Just south of the mining site, the trail follows a former narrow gauge railroad known as the Langdon Mine Railraod which operated only two or three years in the 1880's. Again, the trail departs from the railbed where it once crossed the Black River on it's way to Langdon Mine, now private property. Along this entire section, interpretive signs have been placed to help describe the history of the area.